Browsing the web as usual I came across something that captured by attention. It turns out that Edward Sapir in his 1937 article Hebrew "Helmet," A loanword, and its bearing on Indo-European phonology had reconstructed a Philistine word *kaubaɣ- 'helmet' based on the Christian story of Goliath (1 Samuel 17:5). There in Samuel, the word for 'helmet' is recorded as either kōbáʕ (כובע) or qōbáʕ (קובע), a rather curious word of non-Semitic origin whose mystery has cultivated much academic curiosity. It's certainly connected with Hittite kupahis 'headdress' although exactly how this word was transmitted between Semitic and Anatolian groups is a riddle to solve. Note easterly Hurrian kuwahi too although seeking an origin of this word in Eastern Turkey seems most unlikely despite what Puhvel suggests (see Puhvel, Hittite Etymological Dictionary: Words beginning with K (1997), p.257). Quite eerily, I've already suggested a Minoan word for 'head' or 'summit', *kaupaθa (read Paleoglot: A hidden story behind Cybele the Earth Mother? ), but I was ignorant at the time of Sapir's published hypothesis. This Minoan etymon is my attempt at better explaining (via expected Etruscan *caupaθ) the source of both Germanic *haubida- and Latin caput in a way that an over-cited Indo-European root (*)*kaput- just can't convincingly accomplish without fiddling with the phonetics. Surely, given this particular set of uncannily similar yet phonetically irregular reflexes, we should seriously be thinking about recent loan transmission rather than leaping to the comparatively more contrived assumption of some long-ago Proto-Indo-European utterance. Add to this Greek κύπτω (kúpto) 'to bend forth, stoop forth' for which Beekes fails to find a credible Indo-European etymology and suggests Pre-Greek origin, much to my bookish delight. Nonetheless, some do try even to loosely etymologize the aforementioned Philistine word in Indo-European terms with no noteworthy success. Matching the spirit of Sapir's whimsy while in honest desire to crack this Mediterranean puzzle, I wonder sometimes about the elusive Philistine language and its origins which scream 'Aegean' all over it. 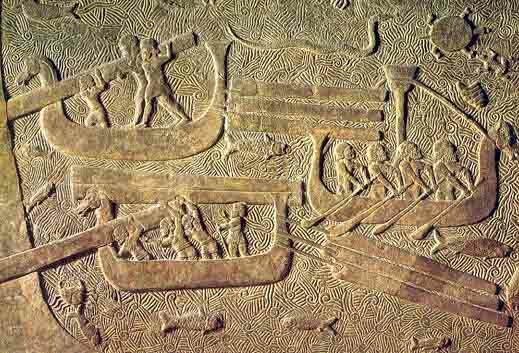 Unfortunately, the Philistine civilization also still screams 'mystery' all over it and with no forthcoming answers in sight. 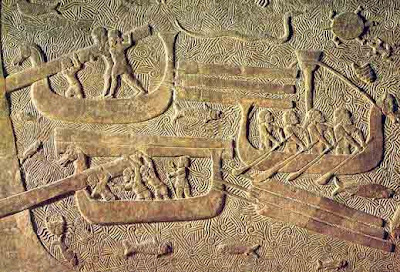 We must remember though the mention of the *Pirastu [prst.w] in Egyptian records, one of the 'Sea Peoples' listed to have attempted a minor coup on Egypt at the end of the 2nd millennium BCE. Now, would it be unfathomable to posit the idea that the Philistine language could be a direct descendant of Minoan (or perhaps a Minoanized language) in which the word for 'head' (and subsequently for 'headdress' through metonymy) became, for the sake of public brainstorming, *kopað in this dialect? Semites, Hittites or some other intermediary might perhaps have misheard the voiced dental fricative /ð/ as a voiced pharyngeal fricative /ʕ/ (ie. ayin) or a voiced glottal /ɦ/. Stranger things have happened in loanwords, eg. the Semitic name of the famed North African city of Carthage which entered into Greek as Καρχηδών (Karchēdṓn), into Latin as Carthāgo, and into Etruscan as *Carθaza. Here's a quick note about a wanderword that I noticed. It starts with a quote from Festus, 403 which equates Latin tibicen 'flute player' with an alleged Etruscan word subulō 'flute player'. What first has to be realized is that this is surely a Latinized form of the original word and so I've had *supulun logged in my database as a suggestion. 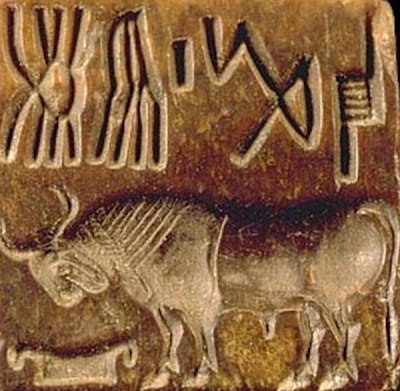 Now I found the term sb.t 'flute' written in Ancient Egyptian, leading me to wonder about its exact vocalism and its connection to the Etruscan word. A quick gander in Crum's Coptic Dictionary shows the same word in Sahidic as sēbe 'reed (of a flute)' which points me to an Egyptian form *sūbat, curiously similar to the Etruscan. The word relates to sbȝ 'to play a flute' which in turn is cognate with Semitic *zamāru 'to play music', suggesting Afro-Asiatic heritage. If the Etruscan word is related, there's no question then that the word is ultimately Egyptian. The next question is how this word would have travelled to Italy. Relating to this caper is another word I've discovered recently in Greek: συβήνη 'flute-case, quiver' (Myc *subānā ?). This is pretty coincidental, I think. The same root *sub- appears to be present as in Etruscan and Egyptian and we even may be seeing an Aegean derivational suffix *-na attached. Is an Eteocretan or Minoan term *supana in order? 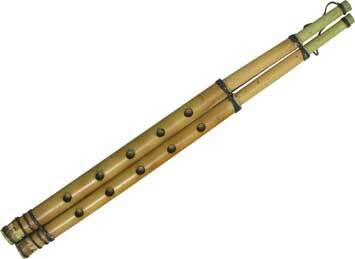 Is the word for 'flute' in Etruscan then *sup? This makes me contemplate because I had assumed up to now that tular is connected to tul 'boundary stone', equivalent to the Latin word terminus. Rightly too, since everyone else in the field, including the Bonfantes and Massimo Pallottino have done so. It's a rational hypothesis afterall. Admittedly however, the -ar termination is left unexplained by these same experts. It seems unlikely that it represents an animate plural ending, contradicted by the existence of tularu with its extra participial ending -u. Tular simply acts like a verb stem, pure and simple. So lacking direction from others, I invented my own answer: it represents a fossilized phrase *tul ar 'to raise/establish a boundary' and thus 'to demarcate'. Thus this explanation has remained in my database for a year or more. However this Venetic verb is tempting to link to the Etruscan look-alike, isn't it? It might even provide a source for this odd verbal affix -ar. In PyrT 1.ix, I think we could even get away with assigning tulerase the meaning '(they) brought' instead of 'demarcate'. Likewise tularu in CPer A.viii may be interpreted as '(was) brought' given the context. Yet the bare form tular in TLE 515, 530, 571, 632, 675 and 676 puts a bad snag in our revisions since the word is clearly referring in all these contexts to the boundary stone on which the word's inscribed. To add to this, we have the epithet Selvansl Tularias, which certainly means "for Silvanus of the termini" (cf. 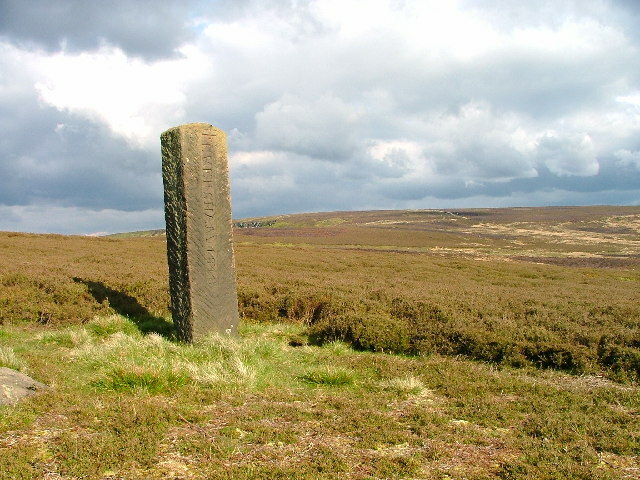 the Roman god of boundary stones, Terminus). Alas, despite the temptation, it looks like we only have an Etrusco-Venetic pair of faux amis. Fool's gold. I'll have to keeping panning by the river yet. The above picture should give a clear picture of how I would wager the Etrusco-Rhaetic languages entered Italy by the beginning of the 1st millennium BCE. I can't help but conclude one thing: the Etruscan and Rhaetic languages eminated from the eastern coast of the Po Valley and spread out from there. 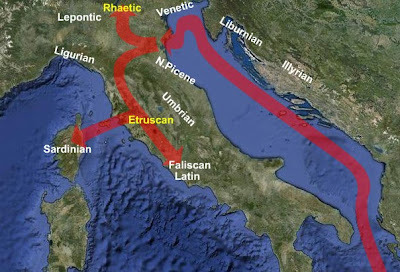 Larissa Bonfante rejected this immigration from the north, attributing the presence of Rhaetic instead to later Etruscan colonization into the Po Valley in the 6th century based on Livy. Her vague and confusing conclusion is that "the sequence of the prehistoric and protohistoric cultures of Italy appears to be continuous from the Bronze Age throughout the early part of the Iron Age, without any interruptions which might have been caused by invasions or the arrival of a new people." Yet the presence of Mycenaean trade in the Po Valley as early as the 12th century BCE, which was known before she even published her 1986 book, strongly makes me want to reject Bonfante's input and go with my instinct. Any Central European influence on the Po Valley, seemingly by land, would naturally be facilitated all the more by Adriatic sea trade so this fact is unsurprising and doesn't say much in itself about cultural continuity of the Villanovan culture separate from its possible cultural exchange with C.Europe. So I'm admittedly confused on this. From a linguistic perspective, something that I don't feel Bonfante is going by, it makes the most sense that the Po Valley would serve as a linguistic epicenter from which the Rhaetic idiom would spread north while the Etruscan dialect would swoop to the south and west. Note however that I'm speaking strictly about linguistic movements, not cultural, economic or demic movements. Taking this for granted, it interests me that the first languages to greet Etrusco-Rhaetic would have to be Venetic, North Picene, and Umbrian. I've been working on word etymologies in Etruscan and I'm finding that some origins of certain words are hard to determine. For example, we could take Etruscan ais 'god' to be a very early Italic loanword, perhaps from Umbrian, yet there is also Venetic aisu- 'god' to ponder on. Which one is the correct source? The word lautuni 'freeman' is so obviously un-Etruscan (< PIE *h₁leudʰ-) yet which language did it come from more precisely? Is it Venetic again? The verb fac , also foreign because of f- without neighbouring u to trigger lenition as it does in so many other circumstances, might be Umbrian fak- or it might be from Venetic, as in its sigmatic form fagsto 'he did/made'. 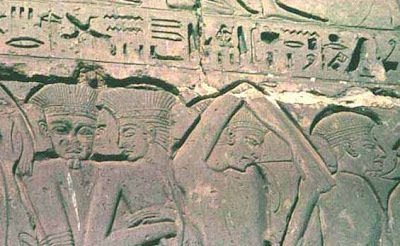 And in what way has the mysterious North Picene language, as exemplified by the Novilara Stele, influenced Etruscan and Rhaetic? While I'd dare estimate that North Picene is Indo-European, it has a unique flair that's hard to classify and few words to come by. Then there's Illyrian... more mystery. All of these poorly attested languages huddle the Adriatic, as we can see in the above map, and it piques my interest all the more while hampering my quest for solid Etruscan etymologies and historic linguistic interactions. Bonfante, Etruscan life and afterlife: A handbook of Etruscan studies (1986), p.48 (see link). Smith, Early Rome and Latium: Economy and society c. 1000 to 500 BC (1996), p.25 (see link); Castleden, Mycenaeans (2005). p.194 (see link); Cadogan, Palaces of Minoan Crete (1991), p.39 (see link); Evans/Evans, The Palace of Minos: A comparative account of the successive stages of the early Cretan civilization as illustrated by the discoveries at Knossos, vol 2, pt 1 (1964) , p.176 (see link); Collis, The European Iron Age (1997), p.34 (see link). I think I finally got it. This etymology has eluded me for a while but with so much to look up I left it on the backburner, simmering like a spicy gumbo. Nonetheless, it frustrated me at every turn. In almost every book, there's always the same answer: "unknown origin". Worse yet, some lazy etymologists tack its origin on Etruscan without any substantiation whatsoever, often without even being qualified in this language, effectively explaining one mystery with another. How convenient. However, just last night, I had a brainwave and it all seems to have fallen into place. Here's what I believe to be the most optimal solution I can muster. I dare say the name of 'Rome' was originally Umbrian, not Etruscan nor Latin: *Rūma. It would literally have meant '(Town of) flowing waters', from *rūmōn 'river; flowing water', a securely Indo-European formation built on the root *reu- 'to flow, to run (as of liquid)' and the derivational suffix *-mo-. When we gander at an ancient dialect map, we see that the ancestors of the Umbri probably covered the area of Etruria before the arrival of the Etruscans. 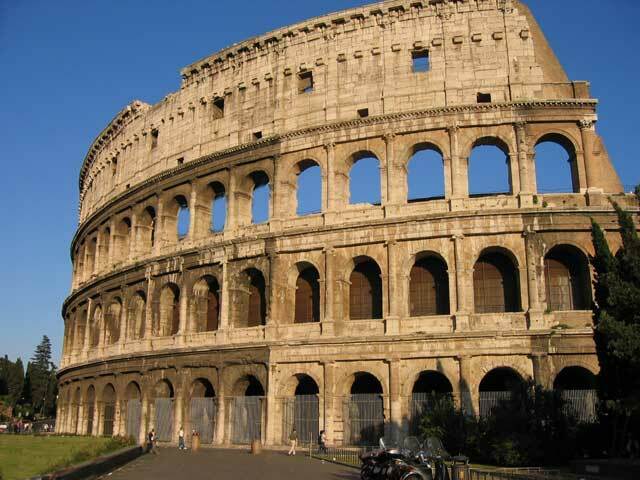 It also helps that an ancient name for the Tiber, the river running into Rome, was Rumon according to Servius. I can find no possible, attested root in Etruscan at all to help us unlock its meaning nor has anyone else published anything convincing and competent to this effect, so an Etruscan origin seems the least likely in all of this. When the Etruscans finally came, they would have adopted the Umbrian name, thus Etruscan *Ruma. Note that Etruscan has no phonemic long vowels. In fact, the Etruscan language has no phonemic contrast between u and o either. Therefore, probably being pronounced [ˈɾo.mə] (assuming u in open syllables was pronounced as high-back /o/), the early Latini would have adopted it as Rōma (its original meaning in Umbrian presumably lost or obscured at this point). Further word associations, immaterial to the debate of Rome's etymology, such as the pun with Latin rumis 'teat' created the myth of the nursing she-wolf protecting the founding twins, Romulus and Remus. Sound good? Good. Gessman, The tongue of the Romans: Introduction to the history of Latin and the Romance languages (1970), p.8 (see link); Pulgram, The tongues of Italy: Prehistory and history (1958), p.256 (see link). Servius, Aeneas 8.63 (see link): "Nam hoc est Tiberini fluminis proprium, adeo ut ab antiquis Rumon dictus sit, quasi ripas ruminans et exedens. "; Servius' passage is acknowledged in Partridge, Origins: An Etymological Dictionary of Modern English (1977), p.2809 (see link). The fact that the author claims "more likely from Etruscan Ruma, the name of an Etruscan clan" despite being comparatively much less secure, even after already elucidating a perfectly rational and sufficient origin through Rumon, is a puzzling but typical display of obscurum per obscurius that continues to irk me as a reader. On June 30, there was a news release about how a computer program has managed to mostly decipher Ugaritic "on its own" (that is to say, re-decipher for the pursuit of computer science advancement). This was already discussed on Memiyawanzi and Abnormal Interests but I feel I should add my two cents considering that I involve myself in both linguistics and computer programming on this site. When I was still in French-immersed gradeschool, I learned quickly that English words don't map nicely to French words in phrases all the time. One clever teacher encouraged me to think of an English joke and to try to translate it into French. As she anticipated my reaction, she delighted in watching the personal discovery she had abetted unfold all over my face. Naturally, the puns on which my joke relied had magically lost their meaning and I realized then very early that translation is quite complex. Unfortunately, many others in adulthood have never taken the time to think about just how complex translation really is. Many people who are monolingual especially have little experience to go on to understand just how difficult this task really is and just how amazingly effortlessly the human brain solves many problems. And after programming things like the online Etruscan dictionary, I can say with some degree of experience that trying to machine-translate something using simple one-to-one mapping algorithms between languages produces ludicrous Babelfish-like results (eg. 'What is on television?' becomes *'Qu'est à la télévision?' on that site for some reason). Even when AI algorithms are added to improve results, the translations are still nowhere near as competent as produced by human beings because they are unequipped to overcome gaps in knowledge or ambiguities in speech like plastic brains can. Historical translation becomes all the more complex because there are even more unknowns involved. The article is interesting but I feel it's a lot of pompous hype from an institution that is no doubt pressured to come up with innovation after innovation, or at least to look like it is. The realistic limitations of this program can easily get misconstrued. What I think will be the truely noteworthy innovation to this complex goal of machine translation is a very general pattern-recognition algorithm, one that doesn't require the guidance of researchers or the programming-in of added assumptions to find and discover new patterns. Yet, if programmers could accomplish that, we'd not only have a fancy translator algorithm but a fully fledged digital human complete with the beginnings of artificial intuition. Until then, these programs are in no way a replacement for human beings and any talk of that sort is more relevant to sci-fi than current reality.